Target Practice: General untimed shooting of targets. Experiment with various target sizes and scores. Accuracy Mode: Shooting with a designated bulls eye and calibrated target area. Displays overall group size and distance from bulls eye on each shot. 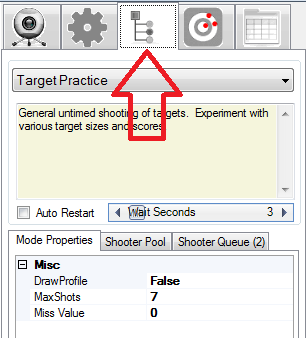 Quick Draw Mode: Shooting against the clock. All shots are timed and an optional par time may be enforced. Shot Commander: Create two or more targets and the shot commander will call your shots. Shooter VS Shooter: Each queued shooter is assigned to a target. First target/shooter to accumulate the configured score wins.Missed shots are not registered. An easy way to handicap a more experienced shooter is to give them a smaller target! Diagnostic Mode: This mode will capture sample images of the shots you take. Use to analyze grip issues, triggering technique, etc..